Cleatech Nitrogen Purge Control system with Oxygen sensor (Oxygen Analyzer) works with inert gas such as Nitrogen and Argon . The system monitors the O2 level 0 to 100% and it’s able to maintain the O2 level inside the enclosure on the desired set point level. It’s an inert gas dual purge system which provides low purge (2-20 Cubic feet per hour) when the O2 level is below the set point maintaining a positive pressure inside the enclosure (e.g glovebox) to have free contaminants and moisture environment. When the oxygen level climbs above an adjustable set point the system automatically activates high-flow purge (20-200 SCFH ). 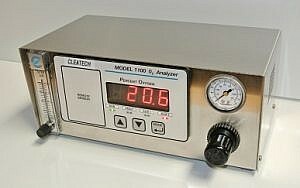 Oxygen Analyzer / Automatic Purge Control Unit with O2 Sensor, 0 to 100% Oxygen level reading range, including external model CAG-250E sensor, locking sensor interface cable, 115/230 VAC, Stainless Steel enclosure, Bench-top, Alarm Output, RS 232 Service port, Available with 4-20mA negative ground, 0-10VDC range ID and choice of 0-1VDC, 0-5VDC or 0-10VDC analog oxygen signal.